Supporting members – wherever they are. The White Lotus learning portal is a web based identity used to impart the ideologies, practices, and standards of the White Lotus System of Unarmed Combat®. This library of White Lotus content provides MCMA members with an equal opportunity to participate in a unique method of learning preparation, art form preparation, and combative preparation. Why create a martial art learning portal? Being in a formal training environment is not always possible. The average adult lifestyle does not always allow for the luxury of time away from our homes, families and responsibilities. As well, some individuals find it challenging to recall information vital to their progression unless in the presence of an instructor. Away from a formal classroom, they lack familiarity with the key ideas needed to ensure that their development is both successful and efficient. The White Lotus System of Unarmed Combat® recognizes the need to support the interests and development of MCMA members at all times – even (and especially) when they are not available to work directly with their MCMA instructor or available to attend classroom based training. In response to this need, a unique internet based learning portal has been created for all members. This learning portal provides MCMA members the unprecedented opportunity to further their own development at all times. 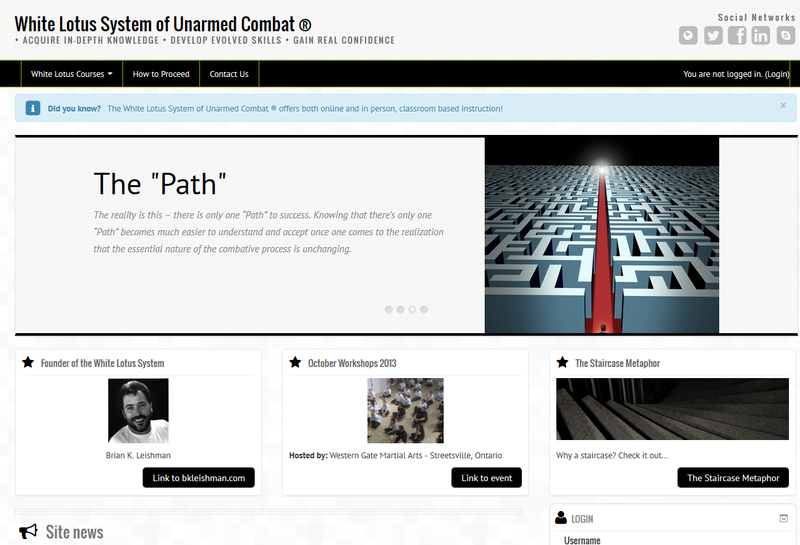 When an individual becomes a member of Modern Combat Martial Arts, they have the opportunity to obtain access to the learning portal, where the lesson content they need to support their development is made available to them, 24 hours a day, every day of the year. The learning portal is a highly organized, interactive resource available to all members as a supplement to their formal, classroom based training. By properly leveraging the learning portal, members can accelerate their development and reduce time spent in formal instruction. See the portal for yourself and browse the content made available to the general public by visiting http://www.whitelotussystem.com/. For more information, please contact brian.leishman@whitelotussystem.com.